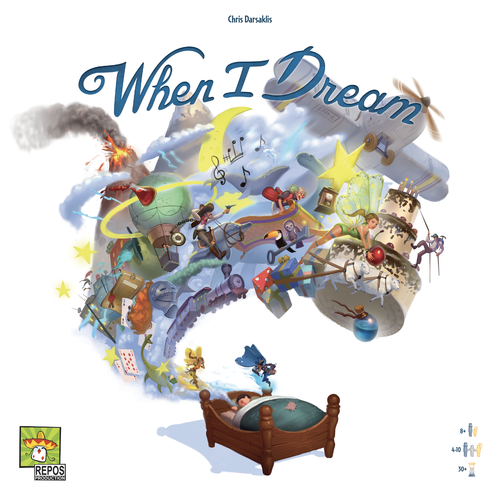 When I Dream is a game where players rotate through roles of being the Dreamer, being Fairies, Boogeymen or Sandmen. 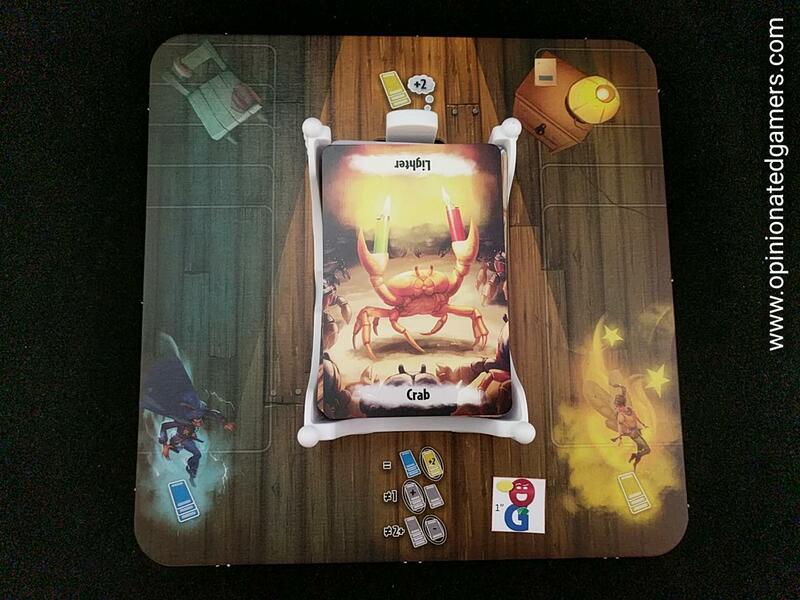 There is a board placed on the table with room for a bed in the center. There is a deck of 110 double sided dream cards; these are shuffled and they are placed on the bed. A number of role cards are chosen based on the number of players. One player is designated the Dreamer for the first round, he is given the sleep mask to designate that fact. The role cards are shuffled and dealt out to the players – there will be one leftover. Everyone looks at their role secretly. 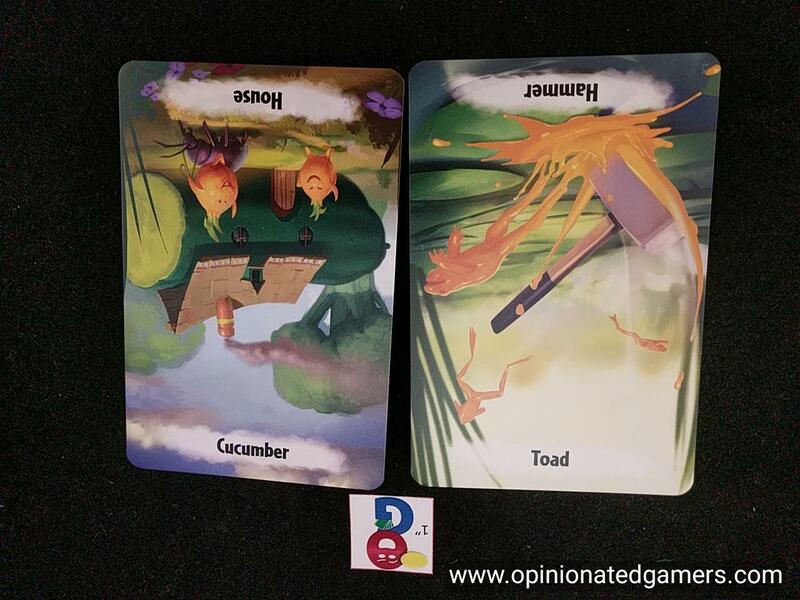 The Dreamer then covers their eyes with the sleep mask and then the top card from the deck is removed to reveal the Element on the card underneath. Then, the two minute sand timer is flipped over. Now, starting with the player to the left of the Dreamer, each player gives a single word clue to try to describe the element. This continues around and around the table until the Dreamer interrupts this to guess what the Element is. If the dreamer is correct, the card is placed on the yellow side. If the answer is incorrect, the card is placed on the blue side. Note that the Dreamer doesn’t know whether he is right or wrong! The Dreamer can also choose to Pass – if this happens, the card is also placed on the Blue side. As the round is timed, a player can be skipped if he takes more than 5 seconds to give a clue. There are some rules on incorrect clues; if this happens, the player who gave the incorrect clue has to take the card and put it in front of him as a penalty point for the end of the game. The Dreamer scores 1 point for each Dream card on the Yellow side of the bed plus 2 extra points if he named ALL of the Yellow elements during his story. The Sandmen score based on the comparison of the cards on each side of the bed. If they are the same, they score 1 point for each Yellow card PLUS 2 bonus points. If there is a one-card difference, they score for the larger number. If there is more than one card difference, they score the lower number. 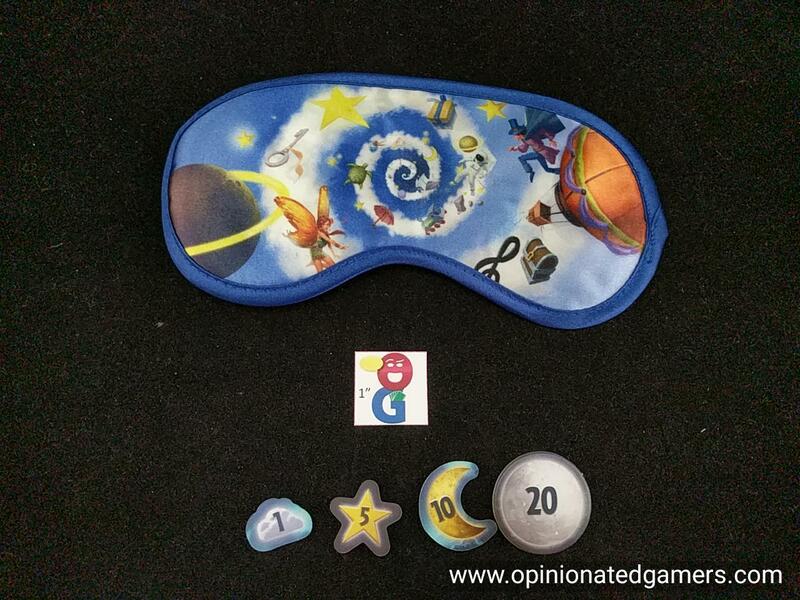 Then, all the cards are placed on the bottom of the deck, the eye mask is given to the next player around the table and another round is played. The game continues until all players have had one chance to be the Dreamer. Players must remember to take a penalty point for each card they have in front of them (for giving an illegal clue). The player with the most points wins the game. I first heard of this game a few years ago when I saw it at Essen (2016?) in its original form, done by Drawlab. I was even less a fan of party/guessing games then, and while it was novel enough to catch my eye, I did not bring a copy of it home from the show. I got a sneak peek at the new version this year at GenCon at the press event hosted by Asmodee, and I was definitely more in the mood for it. I am definitely playing more games like this now than before… and the production quality of the game really does catch the eye. Watching players giggle and laugh while someone is wearing the sleep mask is quite a memorable scene. The artwork and production are a big step up – at least in my opinion. 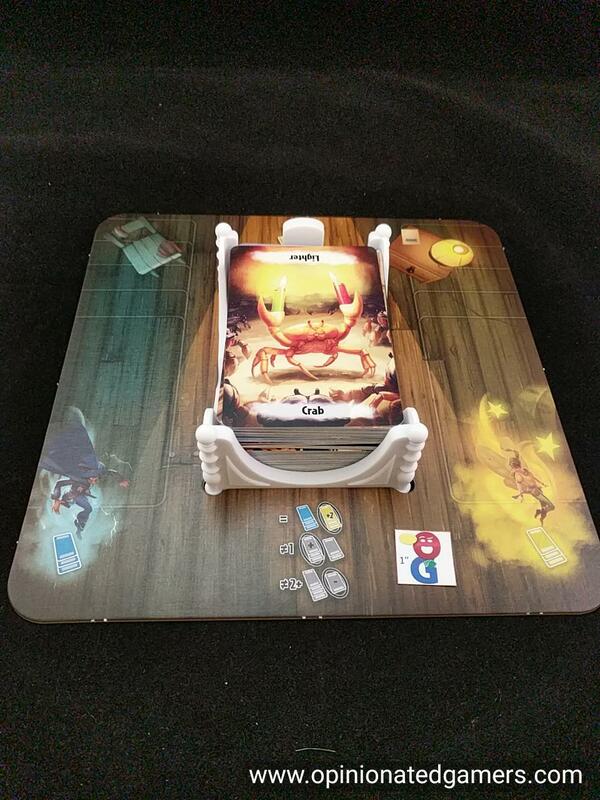 The constructed bed is a nice card holder, and the double sided cards have pretty awesome graphics on them. There are 110 cards in the game, and each side has two different elements on it – so there are 440 different words in the game – enough that I’ll probably not ever have a repeat that I can remember. The game is harder than you think, because each player has different motivations for their clues. 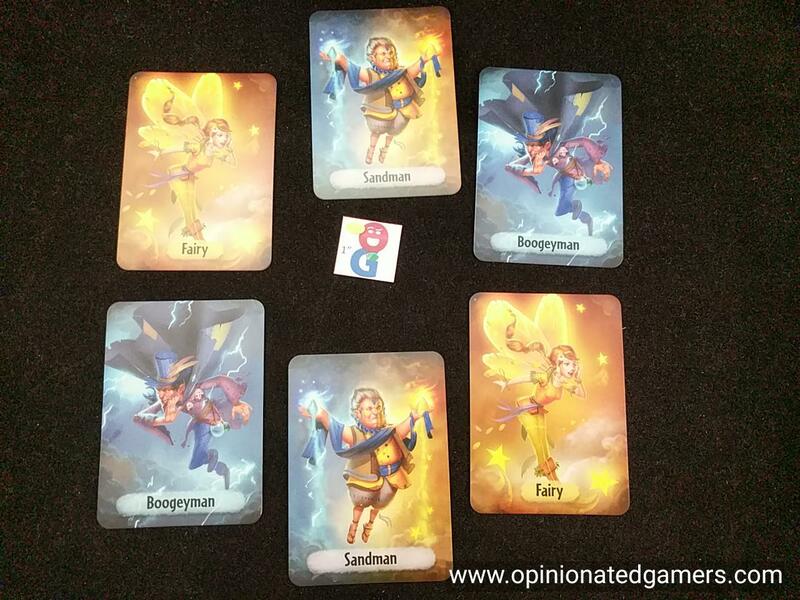 The Fairies want you to get every card right, and the Boogeymen want you to get every card wrong. And, you never know what the sandmen want you to do because you generally have no idea what your score is during the 2 minute round. So, you just do the best you can – either trying to guess things quickly and hope to get them right, or sometimes letting the clues go more than once around the table so you get more clues that might help you figure out what the element is. I have also found it hard to remember all the elements that I’ve named in the two minutes. If I spend too much time trying to remember my list, then I’m not paying full attention to the clues, and I’m more likely to screw that up. Like most party games, the rules are I think meant to be a little loose. It’s hard to really monitor the 5 second rule – that is, someone can be skipped if they take more than 5 seconds to give a clue. And, if you were really gaming the system, you could try to prevent an opponent from scoring as much by stalling just a little bit each time you gave a clue – because then they would have fewer chances to hear clues and therefore give guesses. But, that’s really not the sort of thing that should come up in an experience game like this – just give the clues quickly and enjoy the playing of the game more so than the scoring… well, at least, that’s how I approach this sort of game. Nathan Beeler: This is really the kind of game I should love, and many of the folks I played with did. While I did enjoy it, and would be happy to play again, something felt off. Maybe it was the particular game I was in, but it always seemed like there were too many Sandmen, pushing the proceedings toward chaos. As a guesser it seemed like it was more fun when you could try to suss out who was giving good clues and who wasn’t. There was some of that, and I enjoyed that aspect. But the Sandman role meant it was nearly impossible to discern ineptitude and sabotage. I definitely had rounds where I had was a Fairy, but gave clues like the Sandmen that already outnumbered me. I suppose more plays could allow me to futz with the mix of roles to get it to my liking. Time will tell if it has the legs to give me that chance.